An action-packed programme of clean-ups, safety patrols and crime prevention sessions across Rowley Regis helped kick off Sandwell’s annual autumn Safer 6 campaign. 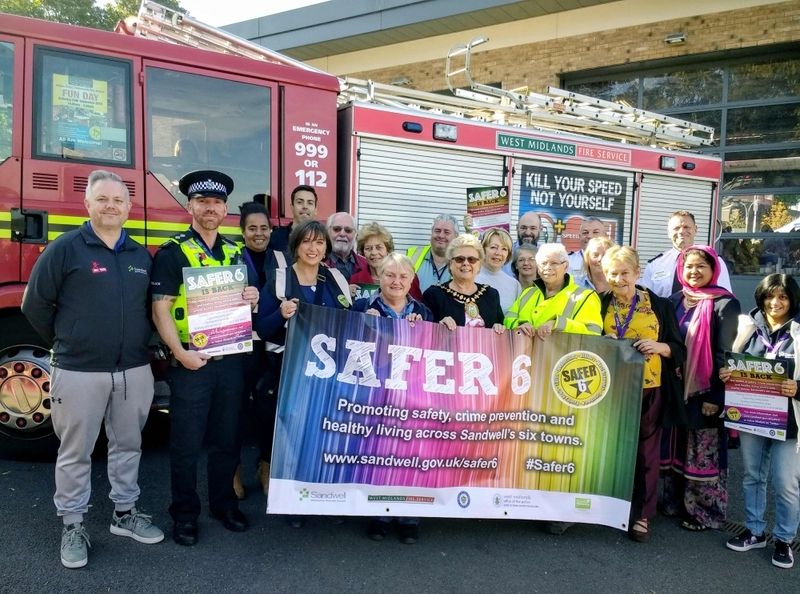 Hundreds of people attended a family fun day and information roadshow at Haden Cross Community Fire Station in Cradley Heath to launch the six-week campaign in style. The Mayor of Sandwell Councillor Joy Edis officially opened the event, which saw a host of entertainment and a wide range of partner organisations giving safety, crime prevention and healthy living advice, covering everything from youth activities to domestic abuse. Each of Sandwell’s six towns has a focus week during Safer 6. Offenders doing Community Payback put in 123 hours clearing 1.6 tonnes of rubbish and overgrowth on the Riddins Estate and the passageway from Throne Crescent to Throne Road, with the council’s estate services team carrying out a clean-up at Wesley Court. Volunteers from Sandwell Crime Prevention Panel spoke to 145 people at the Haden Cross fun day, giving out 130 purse bells, 100 property marking kits and 50 Faraday car key fob pouches, which help reduce car thefts. Police held a successful information roadshow at Sainsbury’s Blackheath, talking with more than 40 shoppers, recruiting two new neighbourhood watch co-ordinators and signing up people to WMNow police email alerts. Police and council officers ran a ‘Park It Don’t Plonk It’ operation at Blackheath Primary School to tackle dangerous parking and chatted with students at St Michael’s CofE High School, setting up a regular surgery there. The council’s young people’s services team held staying safe workshops for young people with the Youth Bus on evenings at Harvest Road, Brickhouse Community Centre and Britannia Park. More than 50 older people received safety advice and information at the Agewell forum at Blackheath Central Methodist Church, with more older residents engaged at a Compton Grange surgery run with SPARCS (Social Prescribing And Reaching Communities Service). Skip days were held at Charles Walk, Rowley Regis, and at Addenbrooke Court and Wesley Court, Cradley Heath, supported by neighbourhood services officers and Litterwatch, with residents filling skips with rubbish. Council officers and Litterwatch held a litter pick and provided skips for residents in Fairway Avenue, Hollies Road, California Road and Wheatsheaf Road, Oakham Estate. Rowley Local office, Litterwatch and the Friends of Codsall Coppice held a litter pick at Codsall Coppice, clearing rubbish bags, a car bumper and a tyre. The council’s environmental protection team distributed a fly-tipping advice leaflet to homes in Barn Close, Trejon Road and Dingle Avenue, Cradley Heath. The council’s domestic abuse team visited local businesses including hairdressers and beauty salons to provide information and advice on what support is available if someone discloses domestic abuse to them. Police and council officers also visited St Giles Court and Moorlands Court, Rowley Regis, to discuss any issues, with Rowley Regis Local Office and Litterwatch running a skip day and Sandwell Children’s Trust - Rowley COG and Young Parents Services putting on a healthy food demonstration. Police and the council’s anti-social behaviour and trading standards teams spoke to residents and gave advice on a range of topics, including white goods safety, at Addenbrooke Court and Wesley Court, Cradley Heath. Go Play Sandwell and Murray Hall Community Trust ran Go Play sessions at Holy Cross Church, Brickhouse Community Centre and Rowley Children’s Centre. Firefighters gave safety talks for older people at Oakham Library and to more than 100 people at a Blackheath Methodist Church surgery. They also gave road safety and fireworks advice to nearly 400 children at Highfields Primary School and carried out 18 ‘Safe and Well’ visits to vulnerable residents. Council road safety officers chatted to parents and children at the end of the school day at Reddal Hill Primary and Springfield Primary schools, giving Be Bright & Be Seen advice and leaflets regarding the use of child car seats. The litter picks and skip days saw a total of 42 bags of rubbish removed and six skips filled. Find out what’s happening across Sandwell’s six towns for the Safer 6 campaign. You can also follow the campaign on Twitter with the #Safer6 hashtag.